Excellent vacuum! I like the idea of not having to buy bags (saves money) This vacuum is worth every penny, as it is effective in floors and carpet thanks to the additional brushes and tools. It is sturdy yet it moves flowless on floors and carpet thanks to the wheels. If you are looking for an excellent quality vacuum that will last years, this Miele vacuum is the one for you. Established in 1990, Mr. Vac and Mrs. Sew is a family owned and operated business. We opened our doors in 1988 with one idea in mind. Our idea was simple -- provide a beautiful place to shop with quality products. The public embraced us and since our humble beginnings we have increased our store size six-fold and expanded onto the World Wide web. For customer service inquiries or to initiate a return, please contact Mr. Vac & Mrs. Sew at info@mrvacandmrssew.com or 631-777-4567. You can initiate a return for new and unopened items within 30 days of delivery for a refund. To qualify for a refund, items must be in new and unused condition with all original materials and/or accessories. If a return is not received at our processing facility within 45 days, it may be subject to a partial refund. You will be responsible for return shipping costs. However, if the return is a result of a fulfillment error, product defect, or damage incurred during shipping, we will refund the full cost of the merchandise. We will provide a pre-paid return shipping label for Non-Buyer's Remorse returns. All returns are subject to inspection, and if found not to be an error on our part, the return shipping costs will be withheld from your refund. SPECIAL RETURNS INSTRUCTIONS: The Seller charges a restocking fee of 5% that will be withheld from the refund. The Seller will issue a partial refund up to 80% for used or non-restockable items. The Miele Blizzard CX1 Electro+ Bagless Canister Vacuum Cleaner is the perfect Miele vacuum for anyone seeking a bagless vacuum! Whether you are dealing with an abundance of dog hair or cat hair, this machine can handle it with ease and all without the hassle of a bag. Not only does the Electro+ provide a deep clean bundled with the convenience of a bagless machine; it comes packed with an SEB 228 Electro Plus Powerhead for carpets and a SBB 300-3 Parquet Twister for hard floors. Additionally, the Electro+ Blizzard comes with a HEPA AirClean Lifetime Filter, which filters up to 99.999% of small particles, built in for the cleanest air possible for life. The Electro+ Blizzard also has a 33-Foot Cleaning Radius so there's no need to constantly change electrical sockets. To top it all off, the Electro+ Blizzard also comes with a Crevice Tool, Upholstery Tool, and Dusting Brush included and built into the back of the Blizzard for easy use making the Electro+ Blizzard a value that can't be beat. First : i am crazy about vacuums had all dif brands. Miele is the best so far. Suction power is just perfect. No need to buy more bags. Ez to clean. I have area rugs and hard wood floor, this vacuum is just perfect for both . Just keep in mind that this vacuum is a little bit big. I am extremely happy with this vacuum! The Miele CX1 is great. I didn’t think I would like as much as my Dyson and it’s even better. It’s easy and doesn’t require bags which is a plus. Love our Miele! Best vacuum ever! Suction was weak.i paid 40 dollars to sent it back.j wouldn't reccomend it. 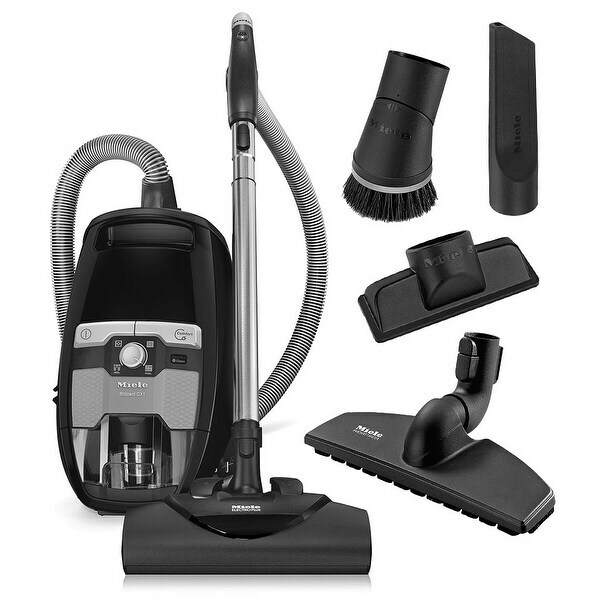 Miele Blizzard CX1 Pure Suction Canister Vacuum Cleaner + SBD285-3 Rug & Floor Tool + SBB300-3 Parquet Twister + More!